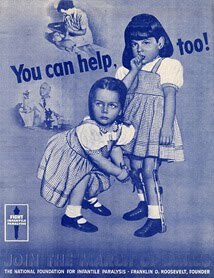 The poster shown above (courtesy of The Smithsonian) was used by the National Foundation for Infantile Paralysis to promote its charity a half-century ago. It is meant to tug at your heartstrings; to encourage you to contribute money for a cause. This past week, our Congress used a similar technique to encourage the passage of healthcare legislation. It used an appeal to charity to get Congressional Representatives to vote for the bill. It might seem strange, but our anti-Republican culture grants moral authority to the Democratic Party to stand in judgment on issues of charity. The Democratic Party deems who is deserving of charity and who is not. It’s not that the Democratic Party actually dispenses charity. That function is still reserved for the various religious and non-profit organizations that perform acts of charity with altruism and with no expectation of reward. The Democratic Party uses the display of charity as a political tool. --This is a flawed healthcare bill! This emotional argument is effective, as it links Republicans to killing. However, it only works so long as our culture grants moral authority to the Democratic Party to use it. Without that implicit cultural agreement, this style of argument would be mocked. Watch for the technique when it is used in “human interest” stories in our major newspapers. These stories are typically written about a person or group that is deserving of charity. In most cases (with very few exceptions) the individual writing the article will be a person associated with the Democratic Party. It’s that entwining a political party and its associated ideology with the delivery of healthcare services has a dark side to it. When a political party is arguing for who is deserving of healthcare and who is not, you should start to see “red flags” being unfurled. Not one of them is a Republican. In fact, Republicans are portrayed as those who are denying these deserving individuals their charity. Republicans are the problem! Think back to the Keith Olbermann piece arguing for charity for his father. Republicans are the problem, and they are characterized as being “ghouls” and “sub-human.” Do you think Keith Olbermann believes Republicans are deserving of healthcare charity? What if I happen to be gay and Jewish and my only chance of obtaining prostate surgery is at a hospital in Iran? Do you think I would be interested in having surgery at a location where the culture has granted the moral authority to its political class to hang me based on my sexual identity and to casually pursue the goal of wiping Israel off the face of the earth? No, I would be choosing the “watchful waiting” treatment rather than surgery. OK, enough of the rhetorical questions and histrionics. Throughout history, political movements reach a demarcation point. As they become more and more powerful, they cross the line from being just “fascinating” to becoming threatening. In the twentieth century, we have the examples of Bolshevism and National Socialism. More recently, we’ve seen the rise of the Khmer Rouge and the Taliban. These are political movements, and the Democratic Party has moved from being simply a political party to being a political movement. Can you hear the Klaxons sounding? In March of 2010, the American Democratic Party crossed the line. Linked by Tim and the "band of bloggers" at Left Coast Rebel! Also check out this post by Professor Jacobson at Legal Insurrection. It seems that when you label political dissenters as "killers", it makes people angry. The characterization of Republicans as killers has become a rallying cry for the Democratic Party subsequent to Mitt Romney's choice of Paul Ryan for VP.